Poor, dumb Dewey Crowe. 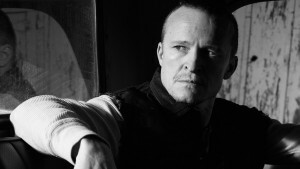 He might have been “sitting high on the fabled catbird seat” early on in this week’s episode, “Weight” (SPOILERS ahead), but even when he was giving Boyd Crowder orders he couldn’t help but add a small, “Thank you.” By the end of the episode, he was left with nothing, including good choices. That also appeared to be the situation for Ava. I frankly don’t see a way out of this for her; even if Boyd hadn’t let that weaselly little prison guard go, she’s now done far worse than what he had accused her of doing. I don’t really buy Boyd’s acceptance of the guard’s explanation for his actions, either. While we may also never know whether the 21-foot rule holds true, what we do now know is that it definitely doesn’t when 6 of those feet are vertical. RIP, Danny Crowe; I hope they buried you with your beloved Chelsea. Along those lines, it was good to see Raylan back at the center of the action and spouting some of the best one-liners for a change. There were also some really striking visuals in this episode – for instance, Raylan considering the tow-truck scene, head down and hat on, against a backdrop of mountains. Very classic Western. Oh yes, whiskey. We had several sightings but none of them definitive. Albert the weasel and Boyd were definitely drinking whiskey at the bar before their confrontation, but no brand was specified. And I think that was a bottle of bourbon that Wendy Crowe used to clock Daryl (although not hard enough, unfortunately), but I couldn’t quite make out the label. Old Charter, maybe? The clearest shot of bourbon this week, in fact, was the commercial for Jim Beam featuring Mila Kunis in the brand’s new “Make History” campaign. As a charter member of Bourbon Women, I approve this message.